Senate Democrats on Thursday pushed through a measure that calls for spending $3.8 billion on everything from higher education to cancer research and home care for seniors, though the money is unlikely to flow anytime soon as the larger budget stalemate continues. Republicans led by Gov. Bruce Rauner deemed the legislation a “cruel hoax,” saying there was not enough money in state coffers to pay for the programs. They accused Democrats of playing more political games, this time with an eye toward the fall election. The measure passed 39-18 along party lines. Indeed, even if the bill never becomes law — Rauner repeatedly has threatened to veto this sort of piecemeal spending — it allows Democrats to stockpile a roll call they can use in campaign mail pieces to say they voted to restore funding while Republicans were opposed. Rauner instead is pushing legislation that would give him broad powers to cut spending in order to free up money to pay for programs and another proposal to help universities save money on contracting and administrative costs. The Senate spending bill mirrors a similar proposal the House passed this month, though Senate Democrats expanded the number of programs the legislation would cover to include grants to libraries and help for Amtrak, among others. In all, the Senate would spend $3.8 billion on a variety of programs. About $700 million would come from taking money out of special funds, while the rest would have to come from the state’s general till. Nearly $2 billion would go to operate the state’s public universities and community colleges, which have gone without state funding since July 1, leading to shortened semesters and broad layoffs at some campuses. About $400 million of that would be earmarked for scholarships for low-income students, which many schools were able to cover last fall but have struggled to pick up this spring. The bill also would spend $472 million on various social service programs, including funding for victims of sexual assault and homeless assistance; more than $550 million on home care for the elderly; and more than $210 million on transit and repayment of borrowing for various construction projects. 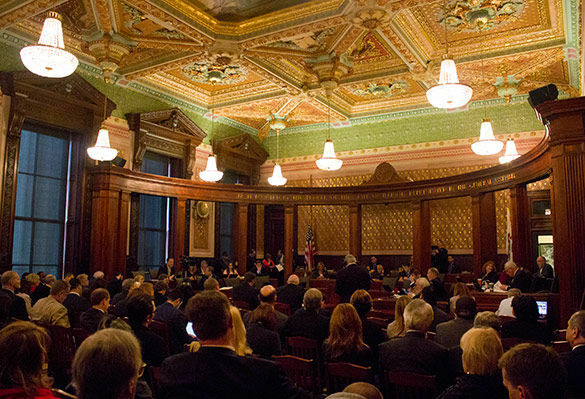 Sen. Heather Steans, D-Chicago, said the measure allows those owed money by the state to “get in the queue” for payment down the road, saying it’s up to the comptroller’s office to prioritize who gets paid when. “These are obligations the administration has already made,” said Steans, who added that lawmakers eventually need to figure out a combination of spending cuts and tax hikes to fully fund government operations. “If you vote for it, at least be honest and tell people it’s not worth the paper it’s printed on,” Rose said. Even without a budget, much of state government continues to chug along due to various laws and court orders. But there’s not enough money coming in to cover the costs, meaning Illinois is on track to end the current budget year an estimated $10 billion in the hole. The Senate and House will be on spring break until the first week in April, prompting criticism from Rauner, who said lawmakers should stay in town to negotiate a budget fix. But the real deal-making usually comes behind closed doors among the governor and legislative leaders, who have not met face to face in months.